You can’t beat our Yogurt Loaf cakes for moistness. 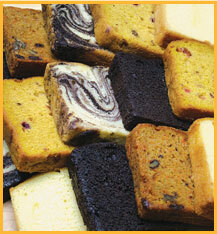 We bake a large variety of delectable flavors fresh everyday. Full of rich, buttery goodness, City Baking Yogurt Loaf cakes are a wonderful gourmet treat - all day long. Apple Cranberry Yogurt Loaf: Our vanilla yogurt loaf topped with apples and cranberries. A wonderful treat with coffee. Black & White Yogurt Loaf: The Black & White Yogurt Loaf starts with our moist, rich and buttery vanilla pound cake and then is topped with chocolate and vanilla frosting. A new East Coast tradition – just like our Black & White Cookie. Available only in loaves. Strawberry Yogurt Loaf*: The fruity flavor of strawberries - perfect for any occasion. Café Au Lait Yogurt Loaf: Our delightful moist vanilla cake with a wonderful coffee swirl.